More and more youngsters are being diagnosed with autism under the age of 3, creating opportunities for early intervention moreso than in any other time in our field's history. 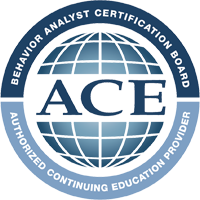 Additionally, young children with other developmental disabilities or delays can benefit from the technologies of Applied Behavior Analysis (ABA) as well, with their disabilities being known as early as birth (e.g., Down syndrome). This presentation will first overview the rationale behind a play-based approach for infants and very young children with or at risk for autism or other developmental disabilities or delays. The presentation will outline basic types of play and their importance to overall development, as well as review some of the play deficits commonly seen in youngsters with autism, developmental disabilities, or developmental delays. Finally, the presentation will describe in detail how to conduct a play-based ABA program with a young child, the importance of family input and participation, data collection, and compare and contrast this approach with more traditional ABA programming. Amanda Boutot, Ph.D., is an associate professor of special education and coordinator of the masters program in autism and applied behavior analysis at Texas State University. She has worked in the field for over 25 year, starting out as a teacher and therapist and moving on to specialist and consultant as she earned her graduate degrees. Most famously, she has the distinction of being the last doctoral student of Dr. Jim Gilliam (Gilliam Autism Rating Scale; Gilliam Asperger Disorder Scale). As a doctoral level Board Certified Behavior Analyst® (BCBA®-D), she has served roles including consultant to public schools and community based centers, trainer, program supervisor, expert witness, researcher and university faculty. She has presented worldwide on ABA, autism, developmental disabilities, early intervention, and play. She has authored numerous peer reviewed professional publications, and authored/co-authored and/or edited several books, book chapters, and has a recently published assessment and curriculum, the Play and Language (PAL) Program for Early Autism Intervention (published by Moontower Publishing).